The British Museum's "Sunken Cities" curator, Aurelia Masson-Berghoff, and assistant curator, Daniela Rosenow, capture the moment as a six-tonne statue of the god Hapy is gingerly raised in place. The colossal statue is one of the centrepieces of the British Museum's blockbuster exhibition, "Sunken Cities: Egypt's Lost Worlds". The exhibition celebrates the discovery of two once-glittering cities that slipped beneath the waves, 1,200 years ago. One of the cities, Heracleion, took its name from the most famous of Greek heroes, Herakles (Hercules). For a long time it was thought that the city was just as mythical. The giant statue of Hapy once stood facing the sea outside the Temple of Amun-Gereb, which occupied the central island of Heracleion. When the statue was discovered in 2001, broken into pieces, the fragments were first assembled on the sea bed to check they had found all of the surviving pieces. Hapy's statue is so tall (5.4 metres) that part of the ceiling of the British Museum's exhibition space had to be dismantled to allow the statue's safe installation. This statue of Hapy is the tallest ever discovered of any Egyptian god. He squeezed in with just 40 cm to spare. 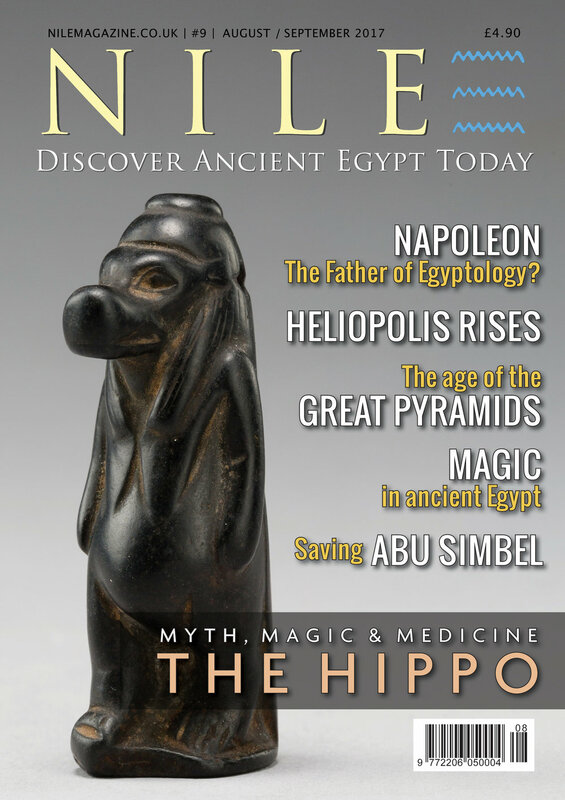 Enjoy the full article in the current issue of Nile Magazine. Subscribe to the print or digital editions from the Subscribe page. Enjoy your Nile time!